With SCI's Aluminum Superdeck System! Illustrative only. System may be adapted for use with other designs without haunches, etc. LOW COSTS WITH GREATER PROFITS! The Superdeck Aluminum Walers are available in 3 series... Standard, Heavy & Super. 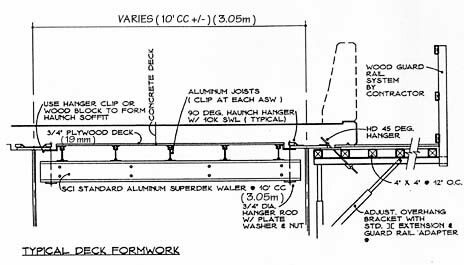 Actual bridge deck conditions such as spans deck thickness, etc. shall determine which one is preferable. SCI will also design, engineer and furnish your bridge deck overhang system and equipment.